2016 was an incredible year thanks to our dedicated supporters! Here are some of our favourite moments of 2016. 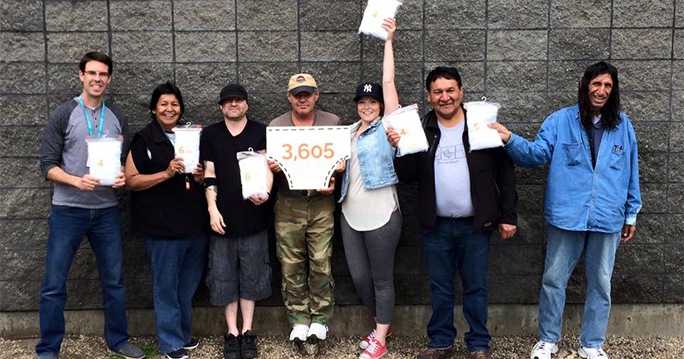 In June, we held our third annual Drop Your Gonch underwear drive, and we set out to raise 2000 pairs of new underwear. The people we serve are always in need of new underwear, an essential item that is rarely donated. Our supporters surprised and amazed us once again: altogether, we collected 3605 pairs for people in need! Visit our campaign page and learn more about the initiative. For decades, Moonlight Bay Centre, our lakefront property at Lake Wabamun, has been a place of solace, rest, and rejuvenation for struggling families. Through traditional summer camp activities, kids and adults alike made meaningful connections while enjoying a respite from the stress of city life. This year, 40 adults and 65 children attended camp at Moonlight Bay Centre. The photos and video footage that we compiled from this summer capture the spirit our one-of-a-kind camp. View the video and photos here. On September 9th, we held a grand opening for Hope Terrace, a housing complex for people living with Fetal Alcohol Spectrum Disorder. At Hope Terrace, 24-hour assistance is available for the occupants, including help attending doctor’s appointments and opportunities for community integration. The project is the first of its kind in Canada, and has even inspired similar initiatives in other cities. Learn more about Hope Terrace here. We served over 3000 special holiday meals in 2016, but it was in early October that we were able to go the extra mile for our participants. Because of our generous donors, we served twice as many Thanksgiving meals! Your help provided warmth and community at a time of year where it’s needed most. Thank you! Was it a good time? The video we made speaks volumes. In September 2015, our newly-created Outreach Housing Team hoped to house 200 people in its first year in operation. But the team surprised everyone by easily crushing their goal, helping 200 people transition off the streets by July 2016, and housing a grand total of 247 people in its first twelve months. Thanks to their efforts, 329 people now have homes, a fresh perspective, and–most importantly–new hope for the future. More than 353 people volunteered as Bissell Elves this holiday season, serving meals, sorting donations, and helping us prepare for holiday festivities. But it was our gift-wrapping fundraiser at Southgate Centre Mall that needed the most support. Showing us what the true spirit of the season is all about, 190 volunteers logged more than 1,300 hours of gift wrapping, raising over $17,000 for people in need in our community. We are so grateful! Check out the Bissell Elf Campaign page to learn more. 7) New Year’s Day Dinner Saved! For 25 years, the inner city community has been able to enjoy a holiday meal on New Year’s Day hosted by Bissell Centre. This year, the economic downturn threatened the success of this cherished New Year’s tradition. But when we reached out for help, our friends in the community came through for us once again, and the offers for support poured in. This Sunday, more than 600 community members are expected to attend the meal where there will be live music, a delicious turkey dinner, and gifts for each guest. Read more about how this year’s meal was rescued by awesome partners in the community. As the year draws to a close and we remember all that we’ve accomplished in 2016, we look forward to the new year energized and inspired by your generosity. We are also reminded that the work that we do at Bissell Centre would never be possible without your support. From the bottom of our hearts…..
Help create more memories like these by joining our family of supporters today. Make a donation by year-end to receive a 2016 tax credit. Thank you if you’ve already given this year, your support is changing lives! Roger arrived in Edmonton 17 years ago, when he was 49 years old. A few years before he moved, he was hurt in a firefighting accident and spent a year in a body cast. After that, he couldn’t go back to firefighting, and started working for a soft drink company instead. He worked there for nine years, while living in Edmonton. When he retired, he found that he could no longer make ends meet and quickly became homeless. That’s when he found out about Bissell Centre, and came for his first visit–about seven years ago. Our staff could see right away that he had a kind heart, as he opened up about his story over coffee and a snack in our Drop-in Centre. We were pleased when he returned the next day, and overjoyed when he came back multiple times over the next week! For the next five years, Roger lived on the streets of Edmonton’s inner city. He made a shelter out of a tarp, for himself, down in the river valley. He never carried personal items with him, like photos or mementos, for fear that they would be stolen or damaged. And whenever he could, he’d come visit us at Bissell Centre. Even though his past has been difficult, the Roger that we’ve come to know and love is a man full of compassion and generosity. A few years ago, he lost his sister, a niece and a granddaughter to an impaired driver. But instead of letting bitterness overcome him, he puts his energy into loving the family he does have–as well as his family here at Bissell Centre. He even manages to send his two remaining grandchildren some money to put towards their education fund–whatever he makes from odd jobs. Not long after he started visiting Bissell Centre regularly, Roger also started volunteering with us. When we asked him if he wanted to help out, he was eager to start giving back. And since he already loved spending time with our community–building trust and friendships with everyone he met–he was the perfect fit. Two years ago, after five years of trying to find a housing situation that was within his means, Roger found a new home with the ongoing help and support of Bissell Centre’s Housing Services. We’ve been so encouraged by the steady growth we’ve seen in this gem of a man, and are thrilled that at 66, he has a place to call home–both at his apartment and here at Bissell. When we asked Roger why he’s so passionate about giving back, he said, “I made a promise to a friend before she passed away. She asked me to help people if I could. I told her I would and I’ve done it up to this day.” Getting housed was another part of this commitment–showing by example that it is possible for anyone coming in off the streets to get housed. Roger has truly become a part of our family here, and we’re as delighted as he is, by the relationships he’s built. “I’m either Dad, Uncle, or Grandpa around here,” he says proudly, describing his role to the other community members at Bissell Centre. As he continues to volunteer with us, he’s continually a beacon of friendliness, hope and understanding for everyone he comes in contact with, and we’re so grateful for his faithful willingness to help. Today marks the Outreach Housing Team’s 1st year anniversary! We were able to launch this housing initiative as a result of the hugely successful Scona Treehouse fundraising event in March, 2015. The Outreach Housing Team met their initial goal to house 200 people in their first 10 months. Today, the team has housed 247 people! We are incredibly proud of the accomplishments both past and present team members have achieved. The Outreach Housing Team has helped numerous people find housing this year. Below is just one of their incredible success stories. When he was not living on the streets, 59 year-old Solomon spent time at Operation Friendship Seniors Society, a non-profit that offers affordable housing options to seniors in the inner city. He also worked odd jobs through Bissell Centre’s Employment Program. Things were looking up, and Solomon’s years of homelessness looked like they would come to an end, when he moved in with his longtime girlfriend. But, just as Solomon’s circumstances were about to change for the better, his partner passed away unexpectedly, leaving him homeless once again. Having exhausted most of his options, Solomon was invited to stay in his previous employer’s garage. It was this employer who eventually referred Solomon to Bissell’s Outreach Housing Team. Within eight days, Solomon had successfully accessed this service, applied for housing, was approved, and moved into a small, comfortable one-bedroom suite with a kitchenette. Bissell Centre also provided Solomon with a number of household items to get him started, including: pots, pans, cooking utensils, dishware, and some food. Hard as things got for Joe* he never gave up. Bissell Centre never gave up on him either. Look at what happened! Employed for many years in the hospitality industry, Joe faced some serious health problems. He couldn’t sustain full time work so Bissell Centre helped with casual labour placements when Joe needed some work. Joe’s health problems were so serious they required six operations to address. Demoralized and losing hope, he was encouraged by social workers to apply for AISH (Assured Income for the Severely Handicapped). Through his ongoing relationship with Employment Services, Joe felt he had” someone in his corner” and never completely gave up. Our Jobs First coordinator got to work with Joe and together they took actions to increase Joe’s skill development, self-awareness, confidence, and his competencies. Last week Joe completed his second interview with a major Canadian coffee company and was hired as the Regional Manager for Quality Control. Joe’s new position will start in mid-August and his starting wage is $60,000 plus a generous benefits package. Joe told us he now wants to speak at our pre-employment sessions about his positive experience in our Employment Services program but more importantly to act as a testimony to never giving up. Our mission is to work with others to move people from poverty to prosperity. When you support Bissell Centre, this one example of how you help change lives. Please consider supporting Bissell Centre’s life-changing work in our community. A line starts to form at 6:30 am each morning at the Bissell Centre Drop-in. By 7:00 am, the line builds upwards to 200 individuals. What’s surprising to people is that 50-75 of those in line aren’t there for a meal or a place to rest; they are there for work. Bissell Centre partners with 500+ employers to provide casual labour jobs for people in need. People who are working–hard–to climb out of poverty & homelessness. In 2013, our Casual Labour Program helped provide 14,000 positions, putting nearly one million dollars in the pockets of Edmontonians living in poverty. This year we are exploring ways to expand our capacity to place more people in jobs, not only casual labour placements, but also in longer terms contracts and permanent positions. Stay tuned for more as the year progresses. Learn more about our Employment Services and our Casual Labour Program. In the recent annual readership poll undertaken by Vue Weekly, Bissell Centre was voted the best non-profit in Edmonton. Each year for the past 18 years Vue asks Edmontonians to identify those organizations, individuals, businesses, venues, and locations that they believe are the best in Edmonton. We are proud to receive such recognition and also celebrate with the two organizations that were runners up: iHuman Youth Society and the Edmonton Humane Society. To see all of the Best of Edmonton Winners, click HERE.